Inflated Odds is a hilarious comedy routine in which a prediction envelope is shown. A coloured balloon is freely chosen and placed into a special balloon zapper. The spectator spins the zapper chamber and the balloon is put to the magicians ear....It does not burst. This continues until the magician predicts that it will go off and then pointing away from the ear the magician or spectator fires the zapper and it explodes. 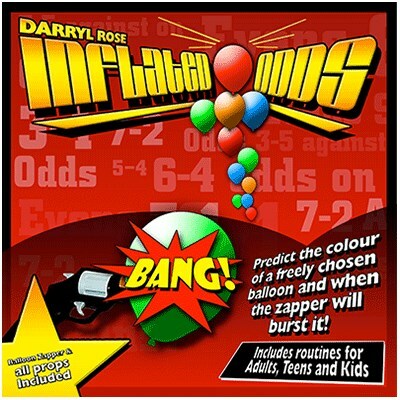 The envelope is opened and inside not only does a Prediction predict the COLOUR of the balloon, but also WHEN the balloon bursts. Routines for Adults, Teen & Kids, Comes complete with Balloon Zapper, Envelope & Balloons.